During a rally stage, the roads are closed and nobody is allowed to drive, walk or do whatever you want on the road, and of course nobody would do that because it's extremely dangerous! 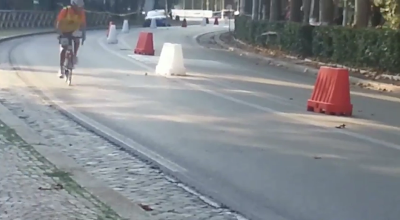 Well, there are no words to describe this cyclist which seems not to give a crap about that he's riding nonchalantly his bicycle in the middle of a rally competition! The whole scene has been caught on camera this weekend during the 1st Rally della Capitale in Rome and it just leaves me speechless how the cyclist doesn't even turns or cares about his life as a rally car nearly hit him and an angry mob started to shout at him. They should have bumped him off the track.